1. 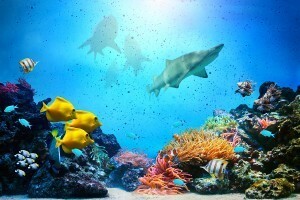 Mandalay Bay Shark Reef The Mandalay Bay Hotel, Casino and Convention Center attraction features 1.3 million gallons of water and over 100 different species of ocean and freshwater fish, reptiles, and 15 different species of sharks. It’s a bit of ocean in the desert and a great place to meet and get to know dangerous ocean predators (and some friendlier species too) face to face. 2. Mirage Habitat Another great exotic nature exhibit in the desert, the Secret Garden and Dolphin Habitat were established by animal entertainers Siegfried and Roy as a preserve, education and scientific research facility for the rare white lions, striped white tigers, dolphins and other animals who live there. Visitors enter the cats’ jungle world and see them in natural settings. The dolphin habitat is 2.5 million gallons of fun and energy as you watch the Atlantic bottlenose dolphins play and interact. 3. Springs Preserve A tourist attraction and nature exhibit all in one, Springs Preserve features botanical gardens, hiking trails, interactive science and live animal shows. The Preserve takes visitors through the natural history of Las Vegas and hosts special events, youth activities and sustainability exhibits and demonstrations. 4. DISCOVERY Children’s Museum Newly located in Symphony Park adjacent to the Smith Center in fabulous new digs, the DISCOVERY Children’s Museum is a truly enriching experience kids will love. The Children’s Discovery Museum engages kids’ energy and playfulness, along with their curiosity and their inquiring minds with a multitude of hands-on exhibits where kids can experience how things work like gears, magnets, light and sound. They can experiment and tinker away in the Patents Pending exhibit ior create Art in the Young at Art exhibit.. Then when they’re tired of reality, there’s the Fantasy Festival where kids can dress up as queens, kings and jesters and see a puppet show. If you haven’t been to the new exhibit, it’s time to rediscover the bigger and better DISCOVERY Children’s Musuem. First, Cowabunga Bay in Henderson, about a 2 0 minute drive from the Strip, is a state-of-the-art water park adventure with all the latest thrills and spills. The kids will love the loops, turns, rafts, waves, and surfing experiences. Parents can lounge on the “beach” or in a cabana and it’s a great way to beat the summer heat. Wet ‘n Wild Water Park is located in Southwest Las Vegas, about 15 minutes from the Strip and is just that. Also a recent addition to Las Vegas, Wet and Wild features lots of innovative and thrilling rides for a fast-paced day of endless fun. Skateboarders will like the Hoover Half-Pipe where things get vertical, and you’ll certainly remember your Vegas experience after the Royal Flush Extreme! Both parks have places for smaller children to enjoy splash pools and play areas. These are our picks, though there are more we can recommend like the tried-and-true Adventuredome Theme Park at Circus Circus, a perennial Best of Las Vegas winner, which is always fun and now offers an affordable all day pass. Or try some great outdoor recreation areas to explore like Craig Ranch Regional Park. There are lots and lots of choices. We hope you give all these family-friendly destinations a try and most of all, have fun!